It’s been a variable summer so far with a bit more rain than most Nordic sunseekers like to see. Yet for those of us who are chantarelle lovers it looks like this is already a remarkable year. The damp forest floors of Scandinavia are already covered in ‘forest gold’, and when my husband found them growing out of the sandy soil under the swings in our children’s playground at our island home, we realized that it was time to take down the mushroom picking baskets hanging from the kitchen ceiling and head out. The culinary mythology around what to do with wild mushrooms once they are in the basket on your kitchen counter is contradictory as it is extensive. ‘Never do this’ and ‘never do that’ are a common means of expressing advice around the precious annual fungi finds. Butter companies adore this time of year and if you happen to be in a Nordic subway station from August until October, you’ll notice that chantarelles are portrayed on billboards as the inseparable buddies of a lump of butter. Clean the mushrooms with a cooking brush (anything resembling a small basting brush is fine). 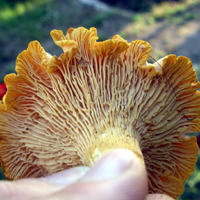 Preserve as much of the mushroom as possible for eating, including the stem. Do not wash in water as the mushrooms become…well…I cannot find another word: mushy. Chop the mushrooms into cross-sections or just roughly. With porcini, make sure that the insects and worms have not gotten into the mushroom first. Heat a thick bottomed sauteing pan with a few tablespoons of ecological extra virgin olive oil. Lower the heat to medium and add the mushrooms. Drain away the excess liquid in the pan after a couple of minutes of sauteing and add some extra olive oil, the crushed garlic and a pinch of salt. Saute until the mushrooms become ever so slightly browned (not burned). Serve on a slice of toast with sour cream and chives or use in a wide range of other dishes. See, for instance, Warm Mushroom Wraps. My friend, Rune Kalf-Hansen, has just come out with a fabulous new cookbook in Swedish language called Kalf-Hansens Ekologiska Kök. If you do read and understand Swedish, you will enjoy his mouth-watering recipe for Kantarellpiroger (his version of Chantarelle Wraps). Rune’s cuisine gives eating seasonally new meaning and he has devoted decades to making people understand why it is important. An authentic work in every way!